16 Greeks are killed and hundreds tortured in Istanbul (Turkey) during a pogrom organised by state authorities. Hundreds of women are raped. 73 churches are destroyed. Turkey is a member of the USA led North Atlantic Treaty Organisation (NATO). A military coup occurs in Turkey. The Prime Minister and two of his ministers are executed. A new constitution is prepared giving the military and increased role in politics. In recent history, Turkey has been run by military regimes which violate the rights of dissidents and of the large Kurdish minority. Even speaking the Kurdish language is forbidden until the early 1990s. As a member of NATO, Turkey's abuses are tolerated by the West and are generally unreported in Western media. All Greek nationals living in Istanbul (Turkey) are expelled from the country after a two day notice. Greece attempts to unite itself with Cyprus, which has a majority of Greeks and a minority of Turks. Turkey invades and divides the island. 37% of the country is occupied with 40,000 troops stationed on the island. Eventually 120.000 Turkish settlers ("colonists") would move to the north of the island. Both Greece and Turkey are NATO members so little is said. The UK, one of the three guarantors of Cypriot independence, has bases on the island but does nothing. Turkey disallows the use of the term "Greek Orthodox" in official documents referring to Greeks in the city of Antioch. Many Greek surnames are forcibly Turkified. In the parliament of Turkey, deputies who speak the phrase "Turkish-Kurdish brotherhood" are arrested and tried for "violating the unity of the Turkish nation". "Anybody who opposes the indivisibility of the Turkish Republic with its nation and its country, will be deprived of their basic human rights and freedoms." 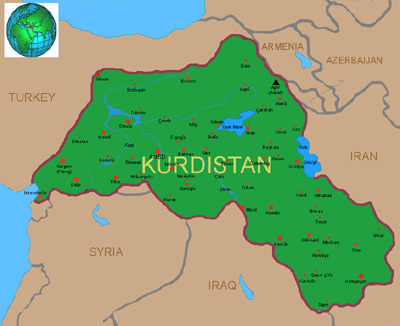 The Kurds, a large minority in the south-east of the country who are referred to as Mountain Turks. A law banning the speaking of Kurdish on the streets is repealed; however, it remains illegal to speak Kurdish in court, in official settings, or at public meetings, and many cultural prohibitions remain in effect. Esber Yagmurdereli, a 53 year old peace campaigner, is given a 23 year jail sentence in Turkey. He is arrested as he leaves a radio station after joining a talk show on 'freedom of conscience'. Leyla Zana, the first Kurdish woman to be elected to parliament in Turkey, has a 15 year sentence increased by 2 years by a panel of 3 judges (2 civilian; 1 military) for her views on Kurdish rights. Hatip Dicle (another Kurdish parliamentarian) is also sentenced to 15 years in prison for pro-Kurdish views. She would not be released until 2004 when she would be nominated for a Nobel Peace prize. The Kurds are a significant minority in the south and east of Turkey. The USA has many military bases in the region and provides military aid to Turkey. Over 27,000 people have died under severe government suppression. Ragip Duran becomes the 29th journalist imprisoned in Turkey. Turkish laws prohibit journalists from covering certain issues like the country's Kurdish minority. Some three hundred issues of left wing, pro-Kurdish, or pro-Islamic publications are confiscated and numerous journals were closed down. Ulkede Gundem (Agenda in the Land), a newspaper advocating the recognition of Kurdish identity, is fined heavily and closed by court order for 312 days. Issues of Hevi (Hope), a weekly newspaper in Kurdish are confiscated 43 times during the first nine months of the year. In Diyarbakir, Sefik Beyaz, former head of the Kurdish Institute, is sentenced to one year imprisonment and a heavy fine for "making separatist propaganda by playing Kurdish music" during his election campaign in 1995. TV stations are closed for "airing programs in Kurdish". The Kurdish Culture and Research Foundation is forbidden to run classes in Kurdish. Several universities refuse to register female students who wear traditional Muslim head scarves. Dr. Eda Guver, is charged with "abusing her authority and violating the civil servants' code" after she asks security forces to leave her office while she was examining victims. The European Union rejects Turkey's application for membership citing oppression of minorities and torture of suspects in custody as reasons. In Turkey, the Justice and Development Party, led by Recep Erdogan, wins the election. Under Turkish law, Mr Erdogan is banned from politics after a conviction in 1998 and cannot become Prime Minister or serve in parliament. His conviction was for reciting a religious poem during a rally. French company, Spie (partially owned by UK company, Amec), applies to government of France for help to build a dam in Turkey. The dam (called Ilisu II) would displace 15,000 people (mainly Georgians) and destroy habitats of endangered species (including brown bears) near the town of Yusufeli). 15,000 others will be affected by losing their economic and cultural centre. 17 villages would be flooded and the water supply to Georgia would be affected. UK bank, Barclays, and French bank BNP Paribas have offered to finance the project. Local people have been consulted only to a limited degree. In 2003, Turkey passed a law allowing the substantial Kurdish minority to have their own radio stations for the first time. As a consequence, the first Kurdish television program is broadcast showing a 30 minute program in a language that was banned until 1991. Turkey has denied the existence of its Kurdish minority (12 million people out of a total population of 70 million) for decades. Over 37,000 Kurds have been killed by the Turkish military in the east of the country where the USA has bases. Western criticism of the actions as well as Western media coverage has been muted. Nobel Peace prize nominee, Leyla Zena, is released after 10 years in prison. She had been in Parliament between 1991 and 1994 where she campaigned for Kurdish rights. Three other Kurdish members of Parliament are also released. Thirteen leaders of a pro-Kurdish political party are prosecuted in Turkey. Their crime was to hold a party congress using the Kurdish language rather than Turkish. If convicted they face prison sentences up to 6 months. Ibrahim Kaboglu and Baskin Oran, two professors who prepared a report in 2004 calling for Turkey to grant more rights to their minorities, are charged with "inciting hatred and emnity". They could face up to five years imprisonment. In Turkey, Ahmet Turk, head of the Democratic Society Party (DTP), and Aysel Tugluk, the party's deputy leader, are both imprisoned for 18 months for using the Kurdish language in political leaflets. The leaflets were distributed on International Women's Day in March 2006.